← The next Artwalk is Saturday, May 7, 5-10 p.m.! 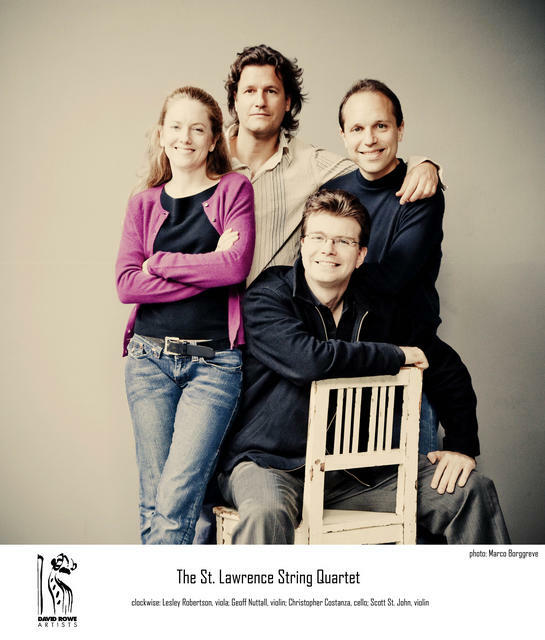 The St. Lawrence String Quartet (SLSQ) has established itself among the world-class chamber ensembles of its generation. Its mission: bring every piece of music to the audience in vivid color, with pronounced communication and teamwork, and great respect to the composer. Joining the SLSQ will be cellist Andrés Díaz, a bold and imaginative player who delivers intense and charismatic performances. This closing concert will feature Beethoven’s String Trio in Eb-Major, Op. 3, Osvaldo Golijov’s Omaramor (1991) for solo cello and Schubert’s beloved Cello Quintet for Strings in C major, Op. 163 with guest artist AndrésDiaz. This concert sponsored by the Lloyd L. & Louise K. Smith Foundation. Additional outreach support provided by the Kenneth L. Calhoun Charitable Trust, Target and Arts Midwest. This entry was posted in akron, Art News, canton, classical, music, ohio, shows, theatre and tagged akron, art news, beethoven, concert, live, music, ohio, show, society, st. lawrence, string quartet, theater, theatre, tuesday musical. Bookmark the permalink.